we have "u-pick" in July for $8.00 a bunch that includes enjoying the farm and if you would like to pick additional bunches… they are $6.50. During the blooming season you can visit the field for $8.00...$3.00 of that can be used as a credit in the gift shop, children 10 and under are free. You can also buy a dish of ice cream for $3.00 ( you cannot use ice cream as your credit ) and sit and enjoy the Lavender in bloom overlooking Dyes Inlet with Mount Rainier in the background. You can take as many pictures as you like on your cell phone and small cameras. During the blooming season we will have sandwiches, baked goods and drinks, no outside food is allowed on the farm. For more information check out Frequently Asked Questions on our farm page. I love it dearly while alone, but I shall love it more with you." We invite you to stroll through fields of Lavender. Enjoy the beauty and relax by the sea for a truly unique experience. During the blooming season you can visit the field for $8.00...$3.00 of that can be used as a credit in the gift shop, children 10 and under are free. You can also buy a dish of lavender ice cream we have 3 delicious gelato flavors for $3.00 a cup (you can use ice cream as your credit on these days) sit and enjoy the Lavender in bloom overlooking Dyes Inlet with Mount Rainier in the background. You can take as many pictures as you like on your cell phone or small camera. and healing skin care products that Lavender can provide. Our Lavender will be in bloom and ready for U-Pick fresh bouquets for $8.00 a bundle that includes entrance to the farm, additional lavender bunches are $6.50. U-Pick does not include a credit in the gift shop. available to answer questions you might have about growing lavender. Suzanne will be available all three days to answer any of your Lavender questions. 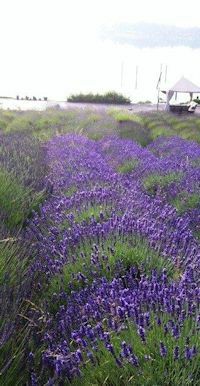 caring for your Lavender and has many unique ideas to share on the use of Lavender. She makes her own soaps, lotions and other bath products. She also distills Lavender to put in her own products. She makes many varieties of dried Lavender arrangements. She is an accomplished cook and knows how to use Lavender in many different recipes. If you are interested in the lavender business, she is the farm girl to talk to. She is self-educated through 20 years of hands-on experience. will be available to discuss all this information during the three days of this event. So plan to spend "A Day in Provence", see the farm and talk with Suzanne.